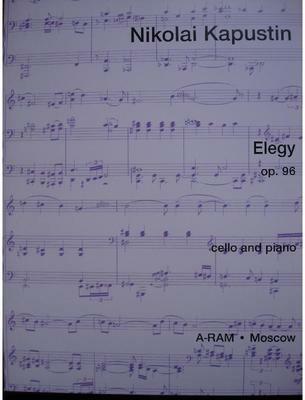 In 1999 Kapustin wrote three short pieces for cello and piano, Elegy, Burlesque and Nearly Waltz. The Elegy is a solemn and pensive composition, and although the tempo marking is Grave it is a nostalgic, rather than sad, piece of music. The beautiful main theme, played by the cello after a short piano introduction, is developed into a central slow jazz sequence, with the cello punctuating the piano part. The work returns to the opening tempo and mood as it draws to a conclusion, with a short coda recalling the central section. What do you want to know about Elegy op 96 by Nikolai Kapustin?